Another installment in the popular 3D fighting game series based on the best-selling Japanese comic books created by Eiichiro Oda. The title was co-developed by Namco Bandai Games and Spike Chunsoft studio – the creators of Danganronpa and the Conception series. One Piece: Burning Blood for PC, PS4 and etc. is a colourful 3D fighting game set in the One Piece universe. The game was co-developed by Bandai Namco and Spike Chunsoft – responsible for a number of licenced productions like J-Stars Victory VS+. One Piece comic book by Eiichiro Oda debuted in 1997 and since then it remains the most popular and best-selling manga in Japan. The intricate, multi-threaded plot presents the story of a young lad named Monkey D. Luffy – an aspiring pirate who has supernatural abilities – and his equally eccentric crew. They look for the famous booty hidden by legendary pirate Gold Roger. One Piece: Burning Blood tells an original story that is nothing more but an excuse for the strongest warriors from the One Piece universe to fight. The manga fans will not be disappointed, as the most recognisable characters from the comic books are there – Monkey D. Luffy, Sabo, Ace, Bartolomeo, Ener, Crocodile, Smoker Drake, Franky, Roronoa Zoro, Aokiji, and many more. 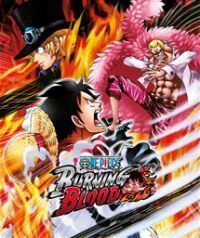 One Piece: Burning Bloood for PC, PS4 and etc. is the classic 3D fighting game that employs several elements that make it different from such series as Tekken. Even though the game concentrates on 1-on-1 combats, during fights you control a team composed of three characters that can be switched at any moment. Each warrior has its own range of moves and special attacks called Logia Moves. By choosing well-corresponding characters, you can build an unstoppable team that combines defensive and offensive abilities. Apart from single matches and series of fights in the arcade mode, One Piece: Burning Blood also supports standard multiplayer. Players can choose the training mode to test characters’ skills. The creators decided to use cel-shading technology that is particularly suitable for a faithful recreation of the characters and the world known from One Piece anime. The voiceover in the game is provided by the same actors working on the anime.